You might recognize the Alstroemeria (Alstroemeria spp.) from cut flower arrangements. They are prized for their cut longevity, lasting up to two weeks in a vase. This native of Chile is commonly known as the Lily of the Incas or Peruvian Lily. The plant produces blooms in a variety of colors including blue, orange, pink, red and white. Alstroemeria flowers grow best in U.S. Department of Agriculture plant hardiness zones 6 through 10. They thrive in well-drained soil in partial sun to full sun and bloom throughout the summer. In colder areas, they add color when used as a container or indoor plant. Deciduous and evergreen species exist, both with green to chartreuse leaves. Under the right conditions, Alstroemeria grow 1 to 3 feet tall and 1 to 2 feet wide, but some purebred species have creeping roots that form colonies to become much larger. Because of this, some species of Alstroemeria are considered invasive and should not be planted near other vegetation. Growers have cultivated noninvasive versions to combat this quality, some called "dwarf" and others "hybrid." For home planting, look for species with one or both of these words in their name or consult a garden center for suggestions. Alstromeria, generally low-maintenance plants, resist deer and attract birds and helpful insects. Although they require well-drained soil, do not allow the soil to completely dry out and provide enough water to soak the ground around the flowers during droughts or dry spells. On the colder end of the approved USDA hardiness zones, mulch around the roots helps to protect the plants from cold and helps to maintain moisture levels during the growing season. To control unwanted spread, deadhead flower to prevent the seeds from falling and reseeding. To prevent diseases, soak pruning shears in a solution of 1 part bleach to 3 parts water for five minutes. Rinse them with water and air dry them before beginning to cut. Cut each dead bloom back just above the leaf node closest to the flower. Apply fertilizer during the growth phase in late winter or early spring, choosing one with a higher concentration of nitrogen than other elements. (Nitrogen is the first number in the thee-number set on fertilizer bags.) A common ratio is 16-4-8, which would be appropriate for this plant. Although you should always default to package directions, the general application rate for a 16-4-8 fertilizer for ornamental plants is 1/2 pound per 100 square feet of space. Some pests enjoy snacking on the Alstroemeria, but most shouldn't cause alarm. Aphids affect primarily young plants; eliminate them by introducing their natural enemy, the lady beetle, into the area. Pick harlequin bugs, a type of stink beetle, from the leaves to stop their munching. Snails and slugs are easiest to remove by bait and trap. Draw them to a covered location, such as an overturned pot, with a snail bait and hand-remove them. Whiteflies are the trickiest pests to treat since they cannot be easily removed by hand and commercially available pesticides do little to discourage them. Catch them using fly traps or discourage them from the area with reflective foils hung around the garden. 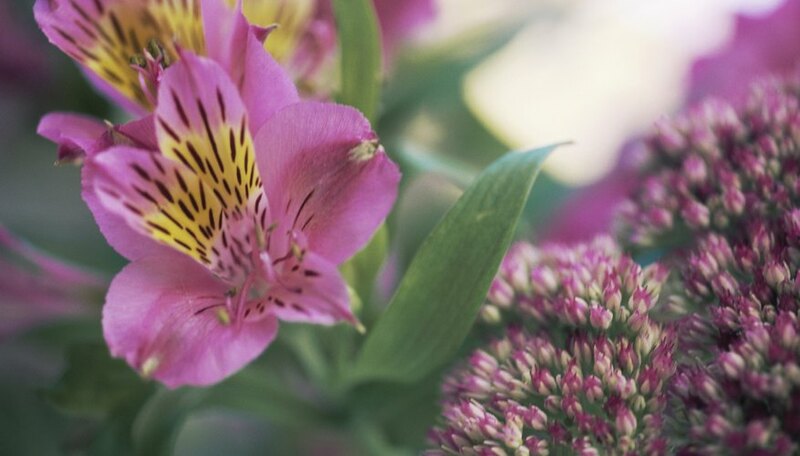 Alstroemeria's diseases are difficult to treat and usually fatal to the plant. Root rot is a fungus that occurs when too much water exists around the base of the plant. The first sign of infection is dull and yellowing foliage that leads to wilt. Buds fail to emerge, and the roots, which turn dark, become brittle and break easily. Prevent it from taking hold by planting the flower in well-drained soil and placing root balls in the ground at the same depth they were in the original pot. Planting the roots too deep can lead to excess moisture along the stem and fugal infection. Viruses begin as spotted or streaked leaves that eventually lead to wilted stems and plant death. In either case, the only true cure is to dig out and destroy diseased plants.